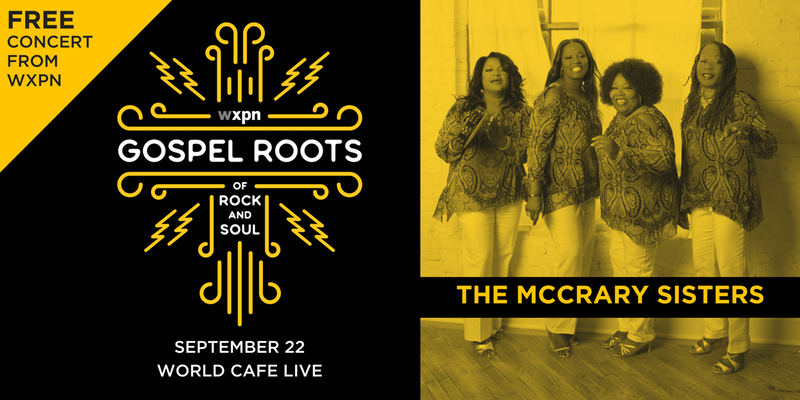 As part of its Gospel Roots of Rock and Soul project, WXPN presents the McCrary Sisters in concert at World Cafe Live. The McCrary Sisters are an American gospel music quartet from Nashville, Tennessee. Formed in 2010, these sisters (Beverly Ann McCrary, Deborah Dianne McCrary, Regina Avonette McCrary, and Alfreda Antionette McCrary) sing a unique style of gospel influenced by classic soul, Americana, blues and R&B. The McCrary Sisters are the daughters of a former Baptist preacher, Reverend Samuel H. "Sam" McCrary, who was a founding member of The Fairfield Four. Growing up the sisters would watch the band rehearse in their home, and this became instrumental in their development as a group today. Since 2010, The McCrary Sisters have released 3 albums. In addition to their own recordings, they are in-demand session singers, having added their amazing backing vocals to records and tours including Bob Dylan, Dr. John, Gregg Allman, Sheryl Crow, the Black Keys and many more. The enlightening story of gospel music’s role and influence in contemporary rock, R&B and soul music is being explored by WXPN, a recognized public radio leader in music discovery. With support from The Pew Center for Arts & Heritage, GOSPEL ROOTS OF ROCK AND SOUL offers live performances, discussions, radio features and documentary, and a content-rich website.